The teaser and first look posters of Mahanati starring Keerthy Suresh, Samantha, Dulquer Salmaan and Vijay Deverakonda have impressed viewers and raised expectations. The teaser and first look posters of Mahanati starring Keerthy Suresh, Samantha Akkineni, Dulquer Salmaan and Vijay Deverakonda have received rave reviews and gone viral on social media. Mahanati (Nadigaiyar Thilagam in Tamil) is a biopic on the life of Savitri. The movie is directed by Nag Ashwin and produced by Priyanka and Swapna Dutt under banner Vyjayanthi Movies. Keerthy Suresh is playing the role of the late legendary actress, while Samantha Akkineni, Dulquer Salmaan, and Vijay Deverakonda reprise other important roles. The film unit has almost wrapped up the production of Mahanati, which is scheduled for grand release May 9. The makers of the movie have kick-started promotions and released some of its promos. They unleashed its first look posters on the internet and its teaser on the YouTube channel of Vyjayanthi Movies on April 14. After releasing the teaser of Mahanati, the producers stated, "The greatest story ever told about the greatest actress that ever lived. It is such a privilege to make a biopic of the one and only Mahanati Savitri, an iconic actress we were ever blessed with. #Mahanati is an ode to the great soul that etched a special place in all our hearts." 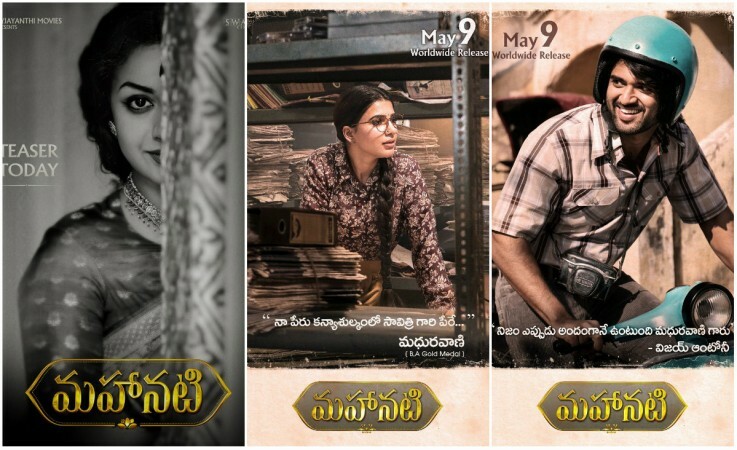 The posters of Mahanati went viral on social media hours after they hit the internet. Its teaser also took the YouTube by storm with its views count crossing 1-million mark in less than half a day. The first look video has registered 1,810,920 views, 47,000 likes and 2,240 comments in less than a day. It has received a positive talk from celebs, critics and audiences. Film critic Idlebrain Jeevi: Saw the teaser of #Mahanati. It's intriguing and classy!! Looking forward for the release. I think the team has a winner in their hand! Filmgoer named Pranita Jonnalagedda: Whooow Such a beautiful image of @KeerthyOfficial as #Mahanati Savitri. Well, there's apparently a lot more in store where that came from Teaser out, later today. The makers of Mahanati had released the first look posters of Vijay Deverakonda and Samantha earlier this week. Both them have received wonderful response and raised the curiosity and expectations from the movie.